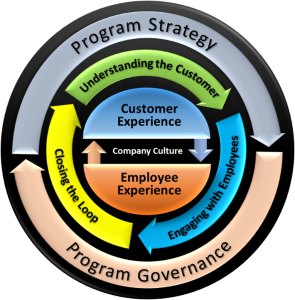 This guide explains the three core components of a Customer Experience Program; Understanding the Customer, Engaging with Employees, and Closing the Loop. It also explains how to create a Formal Strategy and what the proper Management and Governance looks like so you can fully execute the program. Already have a program in place. Test your program maturity to see how you stack up against your competition. 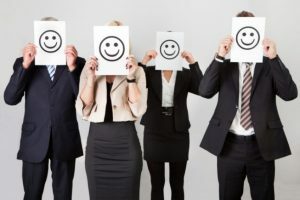 There are three core components; Understanding the Customer, Engaging with Employees, and Closing the Loop that must be at the center of any CX program for it to drive changes to the customer and employee experiences which will create the emotional and personal connections needed to create happy customers which will help to grow the business. For any program to be successful, it needs to have structure. 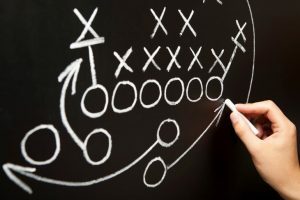 The CX program needs to have a formal strategy with defined goals and objectives along with the proper management and governance to fully execute and guide the program. When all these elements come together, the CX program can create a company culture which is focused on the customers and employees which will then create memorable and desirable customer experiences needed for the company to succeed in today’s ‘Age of the Customer’. The most basic part of the CX program is to understand the customer. What they want, what then need, how they interact with your company, what they think about your products and services… To do this, you need to know look at the customer journey, collect the voice of the customer (VOC) feedback and utilize the key facts about your customers that are already at your fingertips. It is very important to understand how and when your customers interact with your business and its employees. And not just one or two key interaction points, but the entire sum of all their interactions with your company, including information they see via social media and brand marketing. This process is referred to as creating a Customer Journey Map, which are roadmaps designed for documenting all the interactions a customer has with your company. The journey mapping process is a creative one that aids you in understanding the whole journey your customers takes and then allows you to redesign the customer experience. These customer journey maps are created by walking in your customers’ shoes to capture their needs, perceptions, emotions, and feelings they have while interacting with your company. It is important to realize how significant the emotional portion of the customer journey is – think about when you are excited about purchasing something, the feelings you went through while researching and purchasing the product, the anticipation when unboxing and beginning to use it. After mapping out this journey, the next step is collecting feedback from your customers across the entire journey and addressing the issues raised so that you can design better memorable experiences for your customers. The heart of the CX program is listening to customers (and employees) in order to know where to focus improve activities to create the desired experiences. There are many ways to gather Voice of Customer (VOC) feedback; including Relationship Surveys, Transactional Surveys, Strategic Customer Interviews, Mystery Shopper, Observation, Forums, Focus Groups, and Advisory Boards. A strong CX program should use multiple methods to obtain customer insight. And since customer experience is a series of interactions (or touchpoints) as shown through your customer journey map, obtaining customer feedback is more than just conducting a single survey. You need to gather feedback across multiple touchpoints at various points of time. Relationship surveys are a great way to begin gathering VOC as it focuses on the customers’ overall relationship with your business across the customer journey. These surveys ask customers to consider their overall experience with your company and are usually carried out at regular intervals such as, quarterly, bi-annually, or annually. B2C companies usually conduct relationship surveys across their entire customer base while B2B companies will survey multiple members from each client company to understand the complete relationship between the businesses. The Net Promoter Score (NPS) metric is widely used in relationship surveys to gauge and determine which segments within your customer experience need improving. Transactional surveys focus on specific transactions (or touchpoints) between your customer and the business. These surveys are normally sent out right after a key interaction while the experience is still fresh in the customer’s mind. The transactional surveys allow your business to recognize how these touchpoints affect the overall customer relationship and where improvements are required. These surveys also provide a valuable tool to measure frontline staff, processes, and systems. 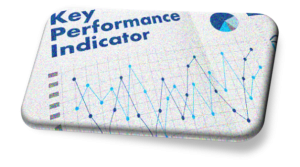 Several standard metrics such, as NPS, Customer Effort Score (CES), and Customer Satisfaction (CSAT) are used to measure the results in transactional surveys. Read our article about How to Collect the Right Feedback. Many businesses routinely collect customer information; what they purchased, what issues needed help to resolve, when they paid their bills, etc. But few companies combine this data that is right at their fingertips with the customer feedback data to create experiences that can ensure customer loyalty and significantly increase profitability. By leveraging consumer data with voice of customer, businesses can tailor personalized experiences, create special promotions that are most relevant to customers, and fully maximize both cross-sell and up-sell opportunities to realize increased revenues. Gathering feedback throughout the entire customer journey and combining it with actual customer data can be essential to the buyer life cycle, marketing campaigns, product development, and across the entire customer journey. Many companies when they start their CX program focus only on their customers, and only later in their journey do they understand the relationship between employees and customers. According to Gallup, engaged employees as those who are involved in, enthusiastic about and committed to their work and workplace. Gallup further states that only 32% of employees in the US are engaged with their company. In the book “The Ultimate Question 2.0”, author Fred Reichheld the creator of Net Promoter Score, builds the connection between engaged employees and loyal customers. Employees who are engaged and promoters of the company will provide better customer experiences, help to drive improvements across the company and excite their fellow employees. As employees create great experiences for their customers, loyal customers in turn provide growth for the company and its employees creating the “promoter flywheel effect”. There are several components in engaging employees across the workplace, starting with hiring employees who are not just talented, capable team members, but who are highly customer focused. Sharing the company vision and providing training and tools needed for employees to succeed also plays a pivotal role in creating enthusiastic employees. But just as a company needs to listen to their customers, they also need to collect the Voice of Employees (VOE) as well. Most companies conduct an annual employee survey which usually leads to lots of wasted energy and little to no results. Instead by conducting continual employee surveys across the organization, the company can gather employee feedback that can be easily enacted upon. The Employee Net Promoter Score (eNPS) question is a great way to survey your employees, collect actionable data, and measure the loyalty to the company. Employee interviews, employee action committees, and one-on-one sessions are additional strategic methods for listening to your employees and understanding the daily issues and concerns they face. Gathering feedback is the starting point, but without acting upon the insight gathered from customers and employees, nothing is accomplished. Businesses must be ready to empower employees and address customer experience pain points in order to create a customer journey and employee environment that builds loyalty and brand advocates. A robust CX program will have a closed-loop process in place to act upon the feedback collected through by the VOC and VOE programs, measure the results obtained, and communicate the insights throughout the organization and to customers. After listening to customers and employees, the collected data needs to be analyzed to determine what actions should be taken. 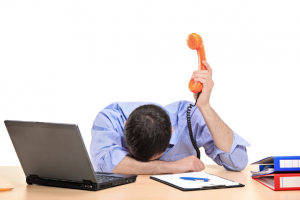 Sometimes the action requires contacting the customer to fully resolve an open issue or feedback to front-line employees on how to improve customer interaction. Often changes to company products, services, processes, systems, and employee training must be made. At times improvements to the customer journey or the employee work environment is essential. Depending on the size of the company, one or more cross-functional teams may be required to oversee the improvement activities determined by the analysis of the collected feedback. These teams can be crucial for not only implementing changes, but also to engage employees across the company. They can help to bring the customer’s voice right inside the organization. For companies to understand the impact they are having to the customer experience and employee engagement, there needs to be a robust measurement component to the CX program. Using systems such as NPS, CES, and CSAT will help measure the progress of CX improvement activities and aid in communicating the impact of the program across the organization. But be careful, often companies focus too much attention on the score and not on the activities. It is important to remember the score is a metric and the activities must remain the focus of the program. Just as it is extremely valuable to bring together CX data with customer data, it is equally valuable to tie CX metrics like NPS with other KPI metrics your business uses such as churn rate, retention rate, response time, and first call resolution. Tying these metrics together will show how your business decisions impact customer experiences and the cost of poor customer experiences. 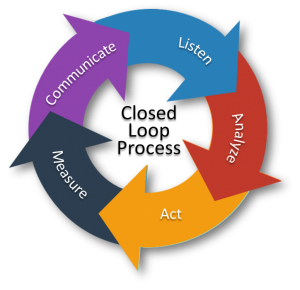 Closing the loop also requires that you communicate back to customers and employees, to let them know that you have heard their feedback and are what you are doing about it. For customers this can be a simple thank you note or a periodic newsletter reflecting on what customers have said and what actions the company has or is undertaking. Sometimes a follow up survey or an additional conversation with the customer is required. To excite and engage employees, share the customer’s feedback (and employee’s) including original responses, improvement activities, and results. This will help employees to see and understand how they are impacting the customer experience and helping to increase customer loyalty. For many companies closing the loop is very large undertaking and may require implementing a Customer Experience Management (CEM) system or platform to bring it all together. A CEM system can allow you to collect all your customer’s feedback, provide real-time analytics through dashboards and automated reporting, track improvement activities, and ensure that you close the loop with your customers. InsightNow! is a fast, simple, low cost solution designed to help you take the first step in collecting and acting on customer feedback. You provide the email addresses of your customers and we do the rest. We create, launch and manage your custom branded survey. Then we analyze the responses and provide you with a Customer Insights Report based on your customers feedback. NPS is one the most popular customer experience metrics used by business around the world. It was created by Fred Reichheld and Bain & Company to measure customer loyalty and predict future business growth. There are two key questions that are asked. The first uses an 11-point scale to measure how likely customers are to recommend your company, product, service, etc. to family, friends, and colleagues. Those who score the company anywhere from a zero to six are considered Detractors. Scores of seven and eight are Passives, while nine and ten are the desired Promoters. Detractors are your customers most likely not to purchase again and often spread negative word of mouth about you to others. They will add to your churn rate and increase your cost of doing business. Passives are customers neither loyal to your products/services or are spreading negative word of mouth about you. Promoters are the loyal customers who are likely to purchase again and are often your brand advocates, helping to tell others about your company. The NPS score is created by subtracting the percentage of detractors from the percentage of promoters. The higher the score, the more loyal your customers are to your business. The second component of NPS is usually an open-ended question asking customers why they provided the score they did. This is the real important part as it provides the details on why your customers are detractors, passive, or advocates. The information here will provide the insights needed to determine what actions need to be undertaken to move customers from one category to another. Several years ago, the founders of NPS rebranded it as the Net Promoter System trying to drive home the importance of the second question and the activities it should initiative across the organization. When both parts of the NPS system is used, it provides a powerful tool for businesses to understand and address the factors that create customer experiences which will drive growth and profits. NPS is a great measurement of the overall customer relationship and can be used across the customer journey, including key touchpoints, product usage, purchasing habits, and social interactions. NPS is one of the best ways to begin for companies just starting out to measure their customer experiences. Although not as popular as NPS as a company-wide CX metric, CES is an insightful tool to learn what makes or breaks a good customer experience. In 2010, Harvard Business Review published an article entitled; “Stop Trying to Delight Your Customers” stating that their research showed that creating experiences that “made it easy” for customers yielded greater customer loyalty than trying to “wow” or “delighting” customers. Today the CES question comes in many variations, but the basic component is to ask the customer “how easy it for them was to accomplish a task” or “how much effort they had to put forth to complete the task”. Normally, either a 5- or 7-scale is used to measure the results. And often a lower score represents less effort and a higher score represents greater difficulty or effort, but you can find the scale reversed. A final CES score is calculated by dividing the sum of all individual customer scores by the number of customers who answered the question. As with NPS, just collecting a score does not lead to much knowledge that will help the business to improve customer experiences. 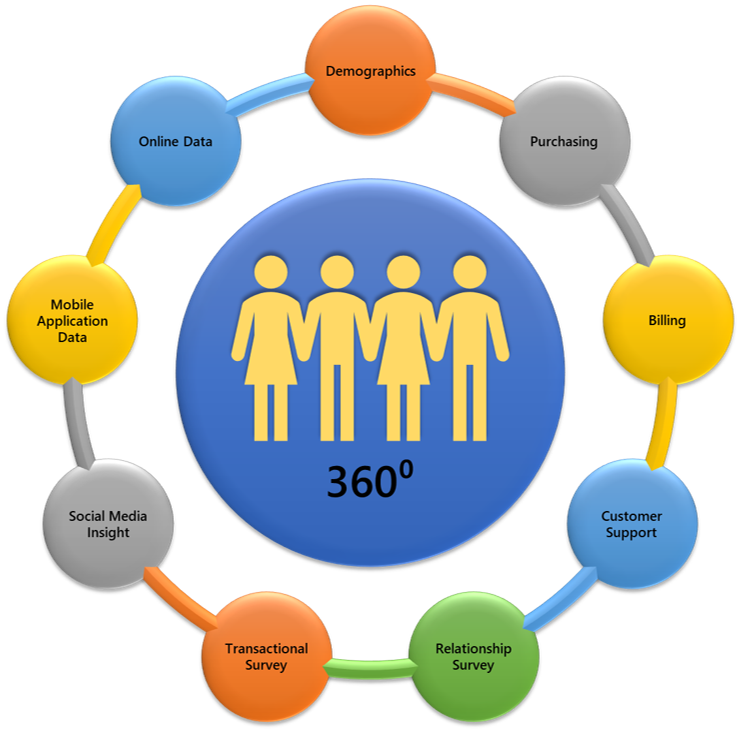 Most surveys will have a second open-ended question asking the customer for more details on the reason of the score. This extra question will provide the needed insight on where to focus attention to decrease customer effort and create customers who are more loyal. CES is most often used in transactional surveys right after a touchpoint or interaction has occurred, such as obtaining customer support, purchasing a product, or paying a bill. CES can also be used in relationship surveys to measure the ease of doing business, which is very valuable for B2B businesses. As businesses conduct activities to reduce customer effort, they will often conduct an exercise, usually internal, where they ask the question “what’s next”. This exercise is to find out what are common second and even third tasks that customers need to take care of after completing the initial one. For example, when a banking customer needs to make a change of address, they often need to order new checks. By understanding tasks that are commonly linked together, companies can make it easier for their customers to complete them at the same time creating a better experience. One of the oldest CX metrics is CSAT, which is used to rate how satisfied a customer is your company. It has been used by businesses for a long time and comes in many forms and scales. Today it is extremely popular as an online tool to rate products, services, and businesses. To calculate the final CSAT score, divide the number of satisfied customers (example: 4 & 5 or 8, 9 & 10) by the number of customers who responded. Often CX surveys will use multiple CSAT questions to obtain information on several parts of the customer experience. The eNPS metric is a based off the Net Promoter Score but is used to measure employee loyalty. It can be a valuable tool in measuring the employee experience and increasing employee engagement which helps the success of the CX program. Compared to standard end of year employee surveys, eNPS tends to be simpler to use and yields higher response rates than the more complicated employee surveys. The eNPS question will either ask employees the likelihood that they would recommend the company's products or services to others or the likelihood that they would recommend the company as a place to work. The same 11-scale and calculation method used for NPS is used for eNPS and a second open-ended question is used obtain the data needed to improve the employee experience. Companies who use eNPS and find ways to correlate it with their customer’s NPS score will find that as one goes up or down, so will the other. Many companies also find that their eNPS score is lower than their NPS score, as employees tend to hold the company to a higher standard. Since eNPS is usually a very short and simple survey, companies often survey their employees frequently. Either sending it out every few months or staggering it across the workforce in order to maintain a continuous stream of employee insight. A structured strategy that is aligned with the company’s business goals needs to be created which will provide the blueprint for the CX program to ensure that its objectives are met. The strategy should center around the brand value, the goals to be achieved, and where the company is in its journey. It should tie into the company’s brand promises and marketing messages. Companies that are trendsetters will constantly review their program strategies, goals, activities and achievements to ensure that their CX program continues to align with their business objectives and brand value. These companies realize that their competitors are improving, that changes continue to happen across their industry and that the needs of customers do not stay static. In recent years we have also seen that customers no longer compare companies within their own industry but will demand great experiences across all businesses that they interact with today. A key element that is often overlooked is a strong program governance that should be led and driven by the company’s top leaders. Management and accountability at all levels from top executives at the C-Suite to frontline employees is required to ensure that the resources and funding required is provided. Program guidance should start at the top with an executive committee that establishes the program strategy, ensures proper funding, and champions the program across the organization. 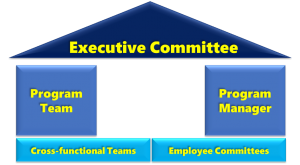 A CX program team with a program manager should be formed to oversee the execution of the program strategy and activities. Often cross-functional teams are put in place to tackle certain program initiatives and employee committees can aid in engaging fellow employees and helping to create a customer-focused culture across the company.